While Rampage will certainly not win any Academy Awards it is a fun ride that has sorely been lacking from the cinema lately. It is truly, in every sense, a fun, popcorn film. A Man and his Ape are not soon parted. So when you take the biggest action star in the world, Dwayne Johnson (Skyscraper) and add a large albino ape as a sidekick you get movie theater gold. Rampage is the latest classic video game to get a big screen adaptation. The game was originally released in arcades in 1986 and then hit the home entertainment market becoming very successful. It featured 3 monsters (a King Kong looking Ape, a Godzilla like creature, and a giant wolf) taking over and destroying cities all the while fighting off the military. Fast forward to 2018, where we see this game come to life from one of its biggest fans, Dwayne Johnson and director Brad Peyton (San Andreas). When the head of a corporation, Claire Wyden (Malin Ackerman; Watchmen) along with her brother, Brett Wyden,(Jake Lacy; Girls ) comes up with a way to make more money for themselves by using one of its discoveries for combat instead of peace we get a picture of what science has gone awry just can look like. Originally intended as a cure for disease with a slight tweak here and there, a new weapon arrives on the scene. In a race to right a wrong and save humanity from destruction, discredited geneticist Dr. Kate Caldwell (Naomie Harris; Skyfall) and Primatologist Davis Okoye (Johnson) join forces to save the world and its creatures from destroying itself. If one starts watching this film thinking they are going to see Oscar-winning performances they will be sorely disappointed. However, if you go in looking for a great thrill ride in the spirit of some of the classic monster films you will be more than happy with the end product. Johnson does what he does best, being his charming charismatic self that can take on the world and win. Harris is a smart intelligent sidekick that is not just brought along for her good looks, while Ackerman truly shows the evil hidden within humans and the worst of our society. Jeffrey Dean Morgan (Supernatural) bantering with Johnson offers some of the best comedic elements of the movie. Peyton does an amazing job with the film, keeping the tension heightened throughout the entire film, giving gamers some easter eggs that don't take you out off the film, and the fact that the science behind Crisper is real should give people something to talk about for a long time after the end credits appear. The only underutilized character throughout Rampage is Joe Manganiello (True Blood), as his role is more a cameo than anything else. Rampage is presented in 2.35:1 aspect ratio with HDR10 and encoded with Dolby Vision. The colors certainly pop (especially a certain red dress!) and the sharpness is perfect on the eyes. Blacks are true, however, the only area that seems to suffer is the special effects. Not because the job by Weta Digital was not amazing. It is just not rendered in a high enough resolution for modern day home theaters. The audio track is truly a wonder. 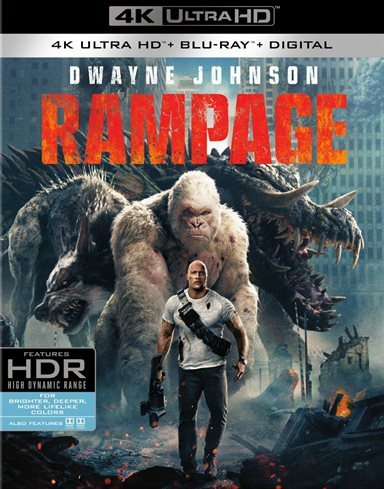 Presented in Dolby Atmos Rampage roars into your living room! The dialog is crisp and clear, while the chaos created by George, Ralph, and Lizzy envelope your entire audio space. The special features are the true gem of this release. New Line Cinema truly went out of their way to give one of the best set of features showcased on a 4k Set for 2018. Aside from the digital HD Movies Anywhere copy, there is an amazing amount of extras included in the set. These include — Not Just a Game Anymore, deleted scenes, A gag reel, Rampage: Actors in Action, Trio of Destruction Attack on Chicago, Bringing George to Life. While some of these are fluff pieces, quite a few dive into some great insights into the film and the process of bringing Rampage to life on the big screen. While Rampage will certainly not win any Academy Awards, it is a fun ride that has sorely been lacking from the cinema lately. It is truly, in every sense, a fun, popcorn film. One that hasn't been seen since 1996's Independence Day. If you haven't had a chance to check it out or want to own the best possible version of it the Rampage 4K combo pack is your best best. Download Rampage from the iTunes Store in Digial HD. For more information about Rampage visit the FlickDirect Movie Database.